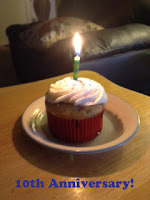 Earlier this month, I celebrated ten years ( diez años ) since surviving my shunt being moved during a revision surgery in April 2009. I didn't know at the time my shunt had been moved. At the hospital, I wasn't properly intubated as the tube used was too large for my throat. I stopped breathing after the surgery around 2am while in a hospital room. When I opened my eyes, my lungs were burning and I couldn't get air down my throat. I could still feel the sensation of the tube inside even though it had been removed. I was given oxygen and barely started breathing again after what seemed like a very long time. A month later, I graduated with my first Master's degree. I'm noticing a pattern when I enter into higher education, I end up having brain surgery. When I was enrolled in my second Master's program, I had brain surgery then too. If it's not one thing like the shunt valve pain, then it's pain from what I suspect is still scar tissue from my injuries in 2014 on the left side of my head. This was gone for a while and then occasionally re-appears at random parts of the day. It's like my scalp is still searching for pieces of my shunt on the left side of my head. There are family issues going on too, which I'm not going to get into....totally not helping the situation. To distract myself from the head issues and everything else...My local library has a coloring therapy group for adults. Just nice to sit with a few people, enjoy some tea and color various designs. This reminds me of a book I read called Zentangle, where you can create drawings which create a calming affect. I just hope my head and shunt pain diminishes soon. It's always a challenge dealing with a chronic illness like hydrocephalus and chronic pain, as any family or individual will tell you. If anything, I feel like pulling out the short hair in my head out of frustration dealing with my shunt...Not knowing what it's going to do each day or hour. Today it's been five years ( cinco años ) since I survived multiple brain injuries during a shunt revision surgery. On March 19 of this month, it will be 4 years since my vision was repaired after my injuries. Only two meals for today since I had this little treat. The cupcake was tasty, the chocolate number five, was just okay. 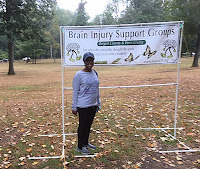 I went to a brain injury support group last night. Since my injuries in 2014, I try to inform others about how shunts can sometimes be put in the wrong way inside the brain. I think it's something that happens more often than we'd like to think. If I hadn't advocated for myself and insisted my (now fired) neurosurgeon fix my shunt, I wouldn't be here. Covert racism has a lot to do with how some doctors dismissed my complaints. Photo of myself after multiple brain injuries in 2014. I had some shunt and scalp pain this morning while volunteering at United Way today. Later this week, I'll be helping Meals on Wheels. Left side scalp pain still shows up sometimes. I think it's where part my shunt used to be or I had one of my three bleeds in that area. 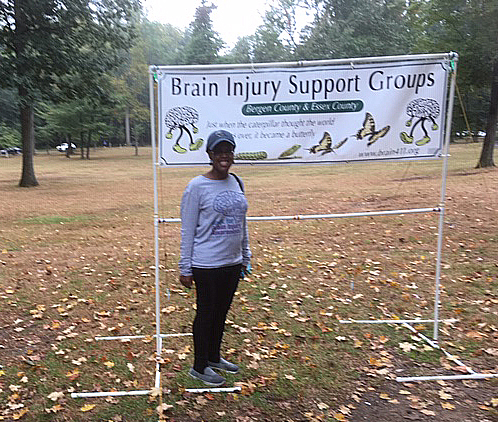 Photo of myself at brain injury walk in 2018. The scalp pain is a significant amount less than it was when I returned home from rehab in 2014. Most of the pain I get is as mentioned before, is from my moody and vindictive programmable shunt valve. Grateful to have survived and that the multiple bleeds I had didn't result in more shunts being put in my brain. Dealing with one is enough. I made a film about my injuries and recovery as a coping mechanism and to help educate as many people as possible about hydrocephalus and brain injury. Therapy helped me a lot to deal with the trauma of my experience. I laugh to myself when I think about the moment I was laying in the hospital (see above) with a bandage covering my head, crossed eyes and partially paralyzed from the waist down. I was angry and sad and at the same time realizing, I had to document my experience. Here's to several more years brain surgery free! Yesterday, I chose to watch Netflix. I figured maybe watching this for a few hours will take my attention away from my pain issues. I couldn't focus on drawing, games or reading yesterday because of pain issues. I was up this morning around 2am for super early breakfast and hoping eating would make the pain less. This didn't work very well. I went back to sleep after eating only to wake up again later in the morning with the same issues from the last few days. I saw a little bit of the super moon on Tuesday evening while on my way to a support group meeting. I didn't know it was a super moon until I saw the news report later that evening. When I saw the rather large yellow moon around 5:45pm and thought it was really cool, not knowing it was a super moon. I have my calendar marked for the next one.